Home » State News » World famous Sun Temple in Konark is safe from all aspects:Union Culture Minister Mahesh Sharma. The Minister of State for Culture (I/C) and Environment, Forest & Climate Change, Dr. Mahesh Sharma at a meeting to review the issues pertaining to Konark Temple and Jagannath Puri Temple with the Minister of Culture and Tourism, Odisha, Shri Ashok Chandra Panda, in Bhubaneswar on December 10, 2018. World famous Sun Temple in Konark is safe from all aspects:Union Culture Minister Mahesh Sharma. Bhubaneswar: 11/12/18:The world famous Sun Temple in Konark is safe from all aspects and there is no threat to its structure, said Union Culture Minister Mahesh Sharma. 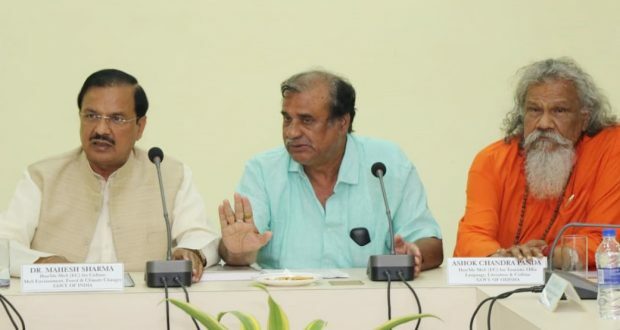 Attending a review meeting on the conservation of Sun Temple in Bhubaneswar on Monday, Sharma said the report of the technical experts of the Central Building Research Institute (CBRI), Roorkee, revealed that the safety standard of the monument is much higher than the minimum level. Speaking on the allegations of replacing the carved stone, the Union Minister pointed out that since 1997 not a single plain stone has been used in The Sun Temple. Sharma assured that a committee comprising international experts will be set up within a month to examine the safety threats and other conservation issues of Sun Temple. Besides, he accepted a proposal for setting up of a museum in Konark to showcase the broken pieces of the temple kept in different museums. Officials of Archaeological Survey of India, CBRI, senior officials of culture ministry, the state culture minister, local MPs, MLAs and residents of Konark were present.